Pakistan which is already having many amazing Cruise Missiles with huge range has once again conducted Successful Experiment of Hatf-VII Babar Cruise Missile on Wednesday. Only few Countries in the World as able to make Cruise Missiles till now and Pakistan is among them. Hatf-VII Babar Cruise Missile has range of 600 KM. The Missile is Capable of carrying Nuclear Weapons with itself. 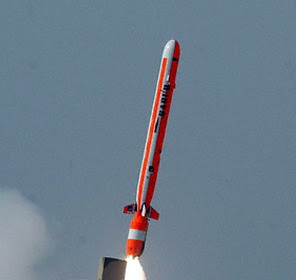 The Missile is having very good features and hits its target with great accuracy. Joint Chiefs of Staff General Khalid Shamim and other Army General where present to see the test of Missile. Prime Minster Yousaf Raza Geelani and President Asif Zardari has also congratulated Pakistan Army on Successful Experiment of Hatf-VII Babar Cruise Missile. By Pakistan many amazing High Range Cruise Missiles Pakistan has left India and Israel Behind in Missile Technology.